Mr Daniel O'Connell had always had a strong sympathy with the Irish peasant, and advocated reforms on his behalf. 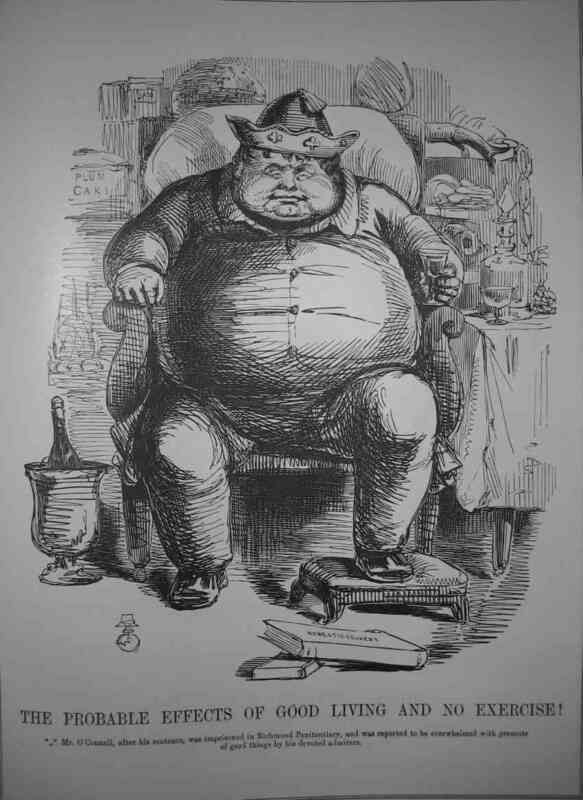 When Peel came into office, he commenced an agitation for the repeal of the Union. 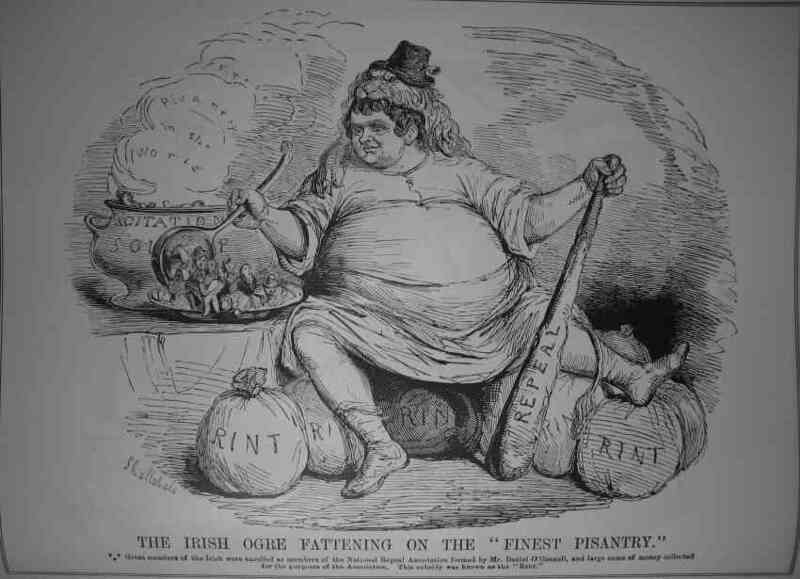 The sums contributed by the Irish to the cause were known as 'Repeal Rent'. 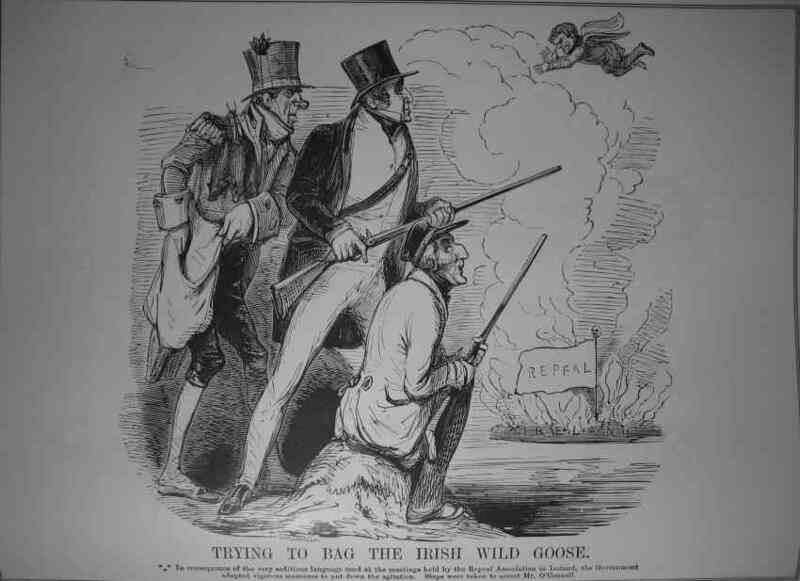 At a meeting held at Tara by O'Connell and the National Repeal Association, exceedingly violent language was used against the Union, and the proceedings generally were very treasonable. As a consequence, the government decided to stop the agitation. Irish affairs occupied much attention. Mr. O'Connel was vigorously carrying on the Repeal movement, and Parliament was determined that the Union should not be repealed. The Duke of Wellington, in the House of Lords, strongly supported the government. 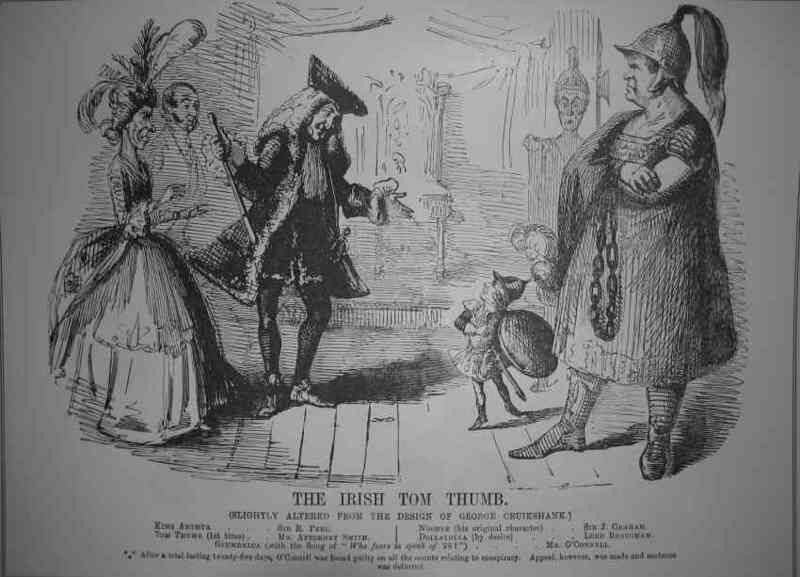 Great numbers of the Irish were enrolled as members of the National Repeal Association by Mr. Daniel O'Connell, and large sums of money collected for the purposes of the Association. This subsidy was known as 'Rent'. 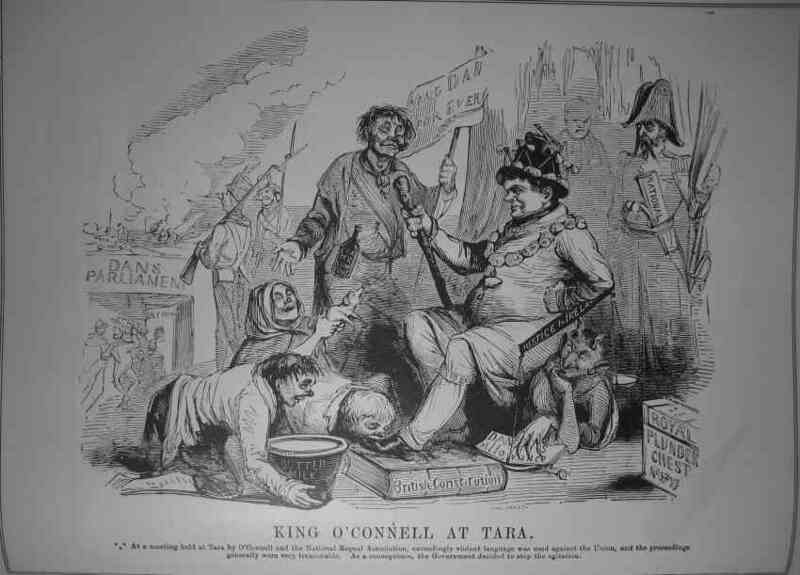 Mr O'Connell's arrest created a great sensation in Ireland, and caused the great agitator to change his tone. He now exhorted the people to "maintain the strictest and most perfect tranquillity." 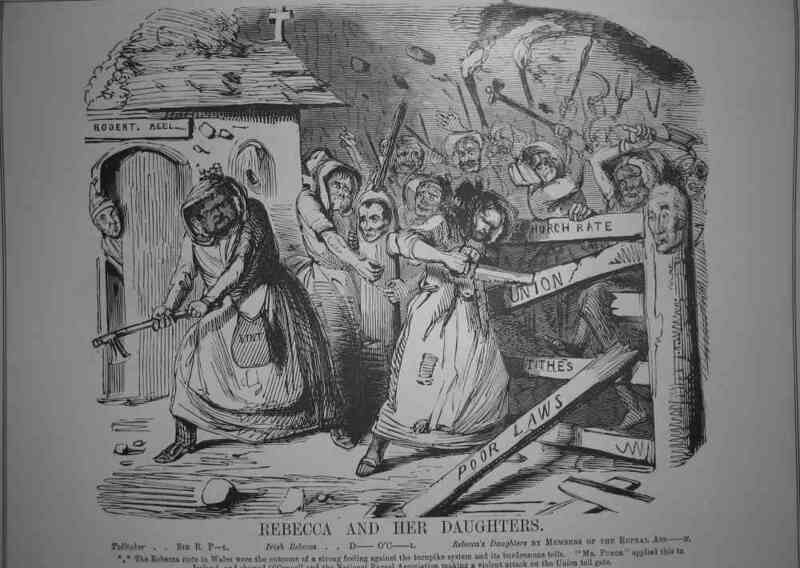 The "Rebecca Riots" in Wales were the outcome of a strong feeling against the turnpike system and its burdensome tolls. 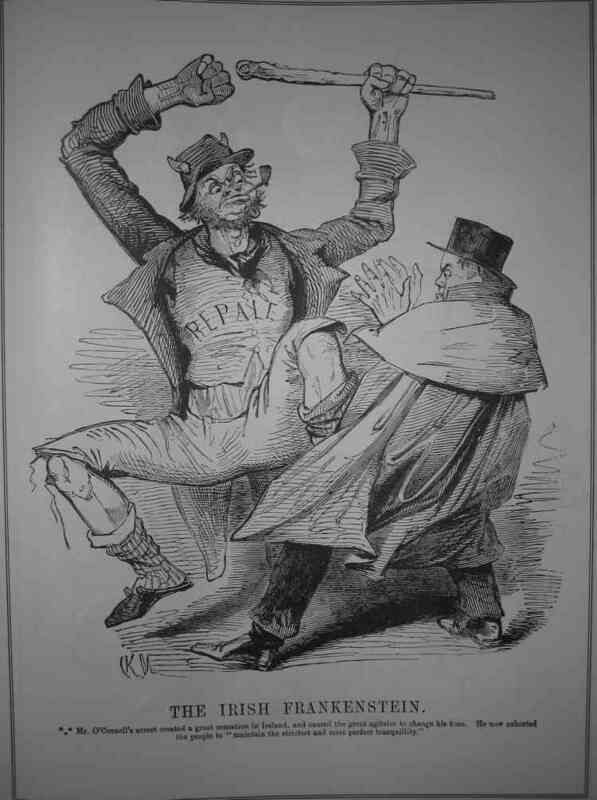 "MR. PUNCH" applied this to Ireland, and showed O'Connell and the Repeal Association making a violent attack on the Union toll gate. 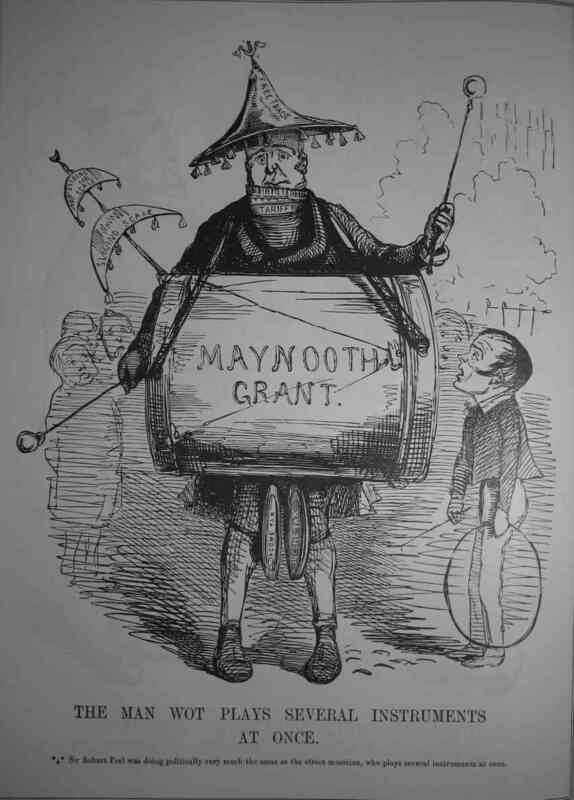 In consequence of the very seditious language used at the meetings held by the Repeal Association in Ireland, the government adopted vigorous measures to put down the agitation. Steps were taken to arrest Mr. O'Connell. 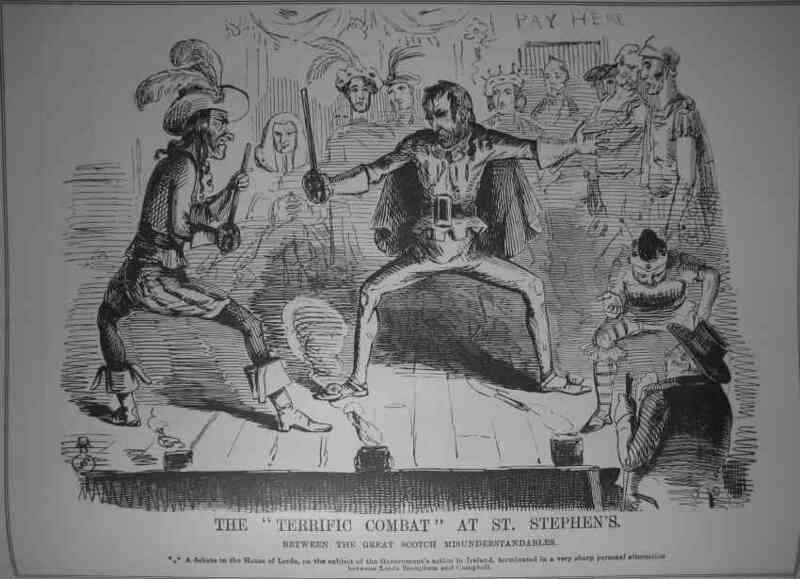 The trial of Daniel O'Connell, on charge of conspiracy and misdemeanour in connection with the repeal agitation in Ireland, was commenced in Dublin. 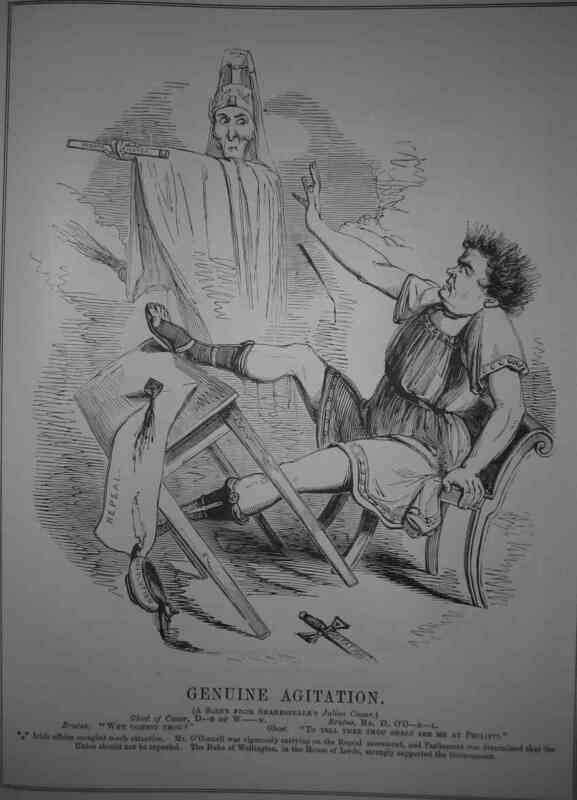 Sir Robert Peel was typified as Jack the Giant Killer. Mr. O'Connell, after his sentence, was imprisoned in Richmond Penitentiary, and was reported to be overwhelmed with presents of good things from his devoted admirers. The Emperor Nicholas of Russia was at this time on a visit to the Queen. 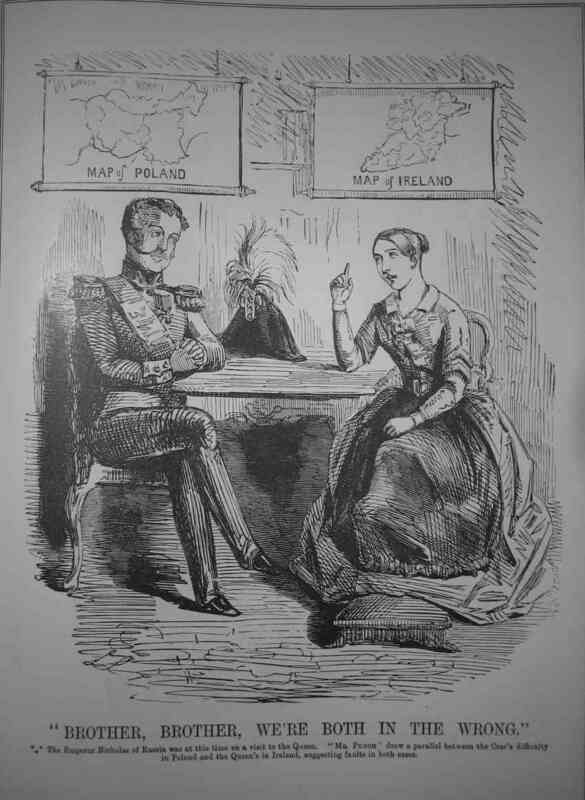 "MR. PUNCH" drew a parallel between the Czar's difficulty in Poland and the Queen's in Ireland, suggesting faults in both cases. 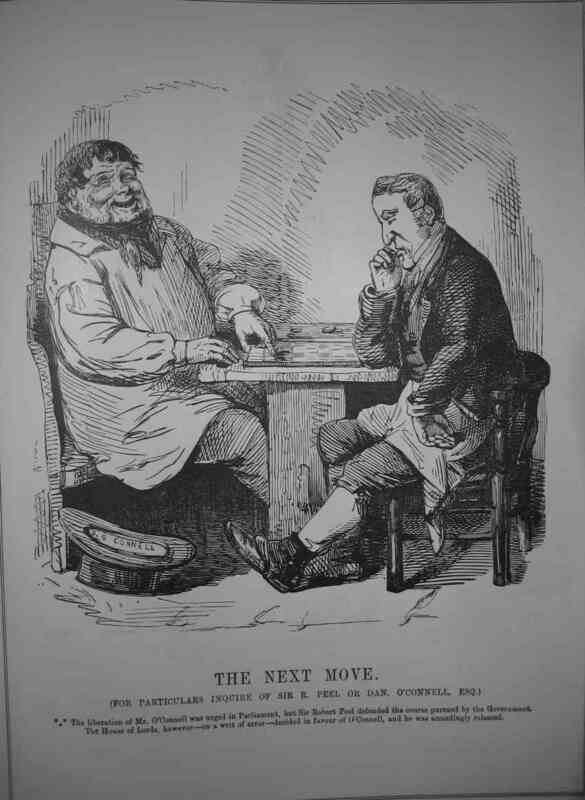 A debate in the House of Lords, on the subject of the Government's action in Ireland, terminated in a very sharp personal altercation between Lords Brougham and Campbell. 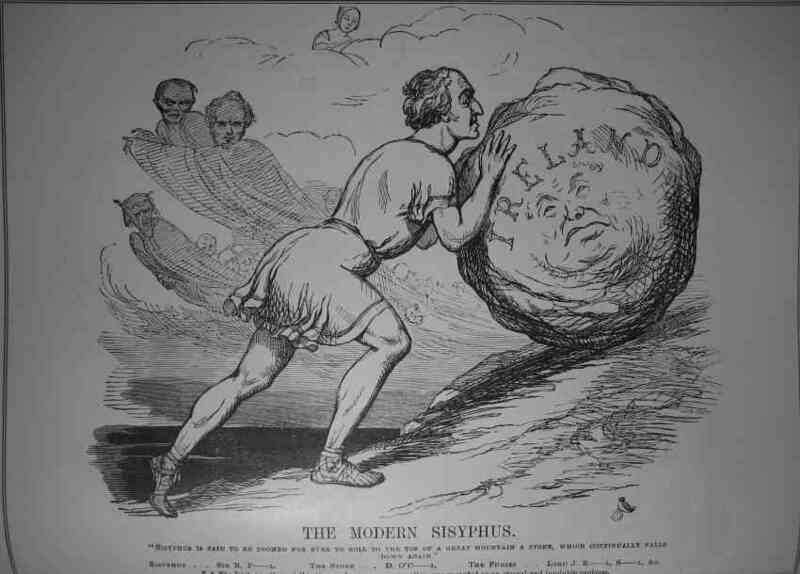 "Sisyphus is said to be doomed forever to roll to the top of a great mountain a stone, which continually falls down again. After a trial lasting twenty-five days, O'Connell was found guilty on all counts relating to the conspiracy. Appeal, however, was mailed and sentence was deferred. 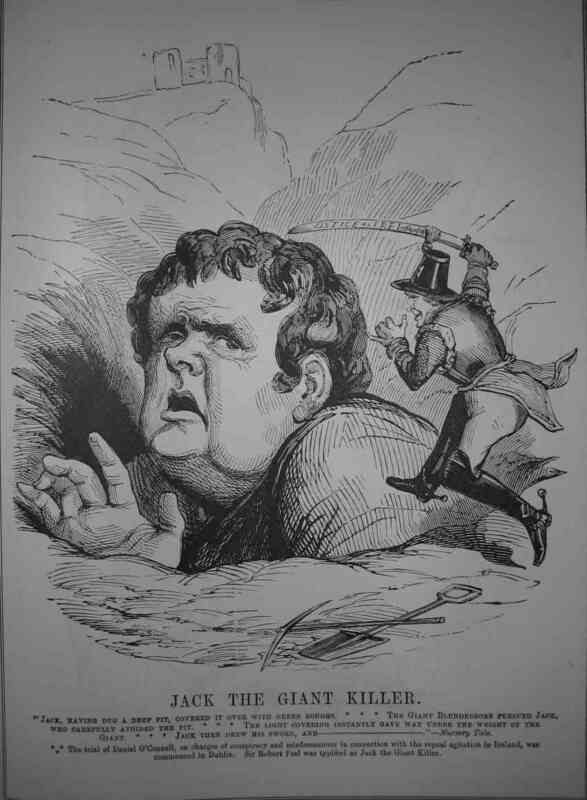 The liberatin of Mr. O'Connell was urged in Parliament, but Sir Robert Peel defended the course pursued by the Government. 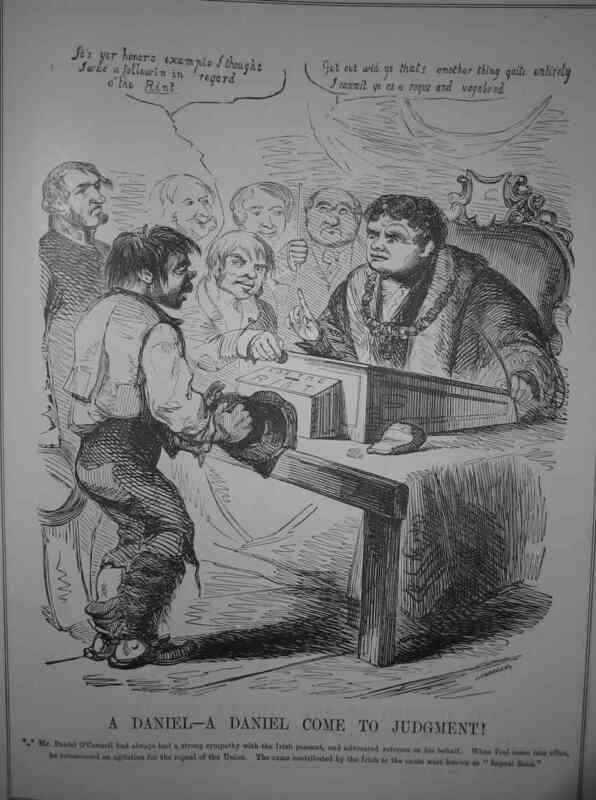 The House of Lords, however - on a writ of error - decided in favour of O'Connell, and he was accordingly released. 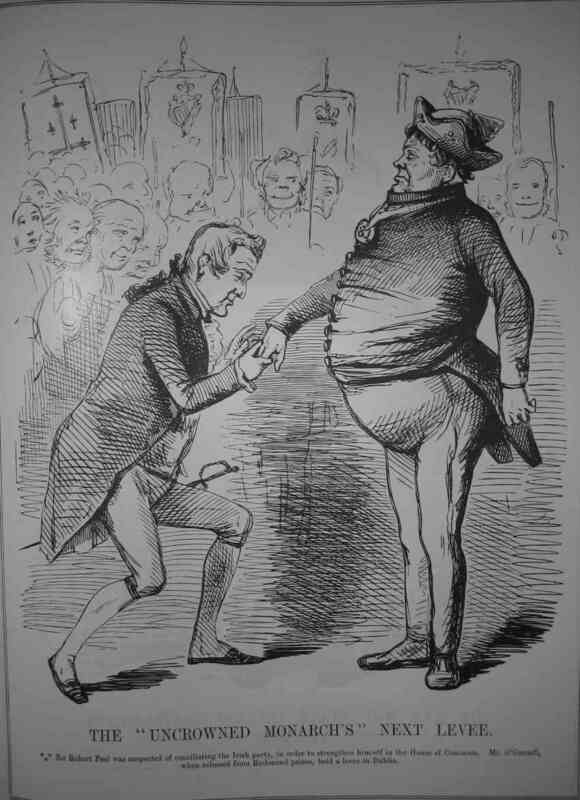 Sir Robert Peel was suspected of conciliating the Irish party, in order to strengthen himself in the House of Commons. Mr. O'Conell, when released from Richmond prison, held a levee in Dublin. Sir Robert Peel was doing politically very much the same as the street musician, who plays several instruments at once.